In a world afflicted with famine, malnutrition, and food insecurity, there exist many programs that attempt to help those in need of food. For the most part, it is third world countries that experience the highest levels of food insecurity. For this reason, most large-scale food aid operations occur between first world countries, who act as providers, and third world countries, who act as recipients. This has been the system for over 50 years, thus begging the question — Why, after 50 years, are these countries still dependent upon outside sources to feed their populations? Are these countries physically incapable of growing enough food? Or is the status quo of external food aid hindering these countries from developing sustainable solutions to food insecurity? International food aid, as it exists today, acts as an obstacle to self-sufficiency in recipient countries. With the United States providing the majority of food aid across the world, it is important to understand their policy on food aid in order to appreciate how modern food aid is not in any way as efficient and productive as it could be. With upwards of one billion USD dedicated annually to food aid by the US, a fair amount of that money is spent benefitting Americans. One hundred percent of US international food aid is legally required to be grown by American farmers, paid for by the government with aid money. 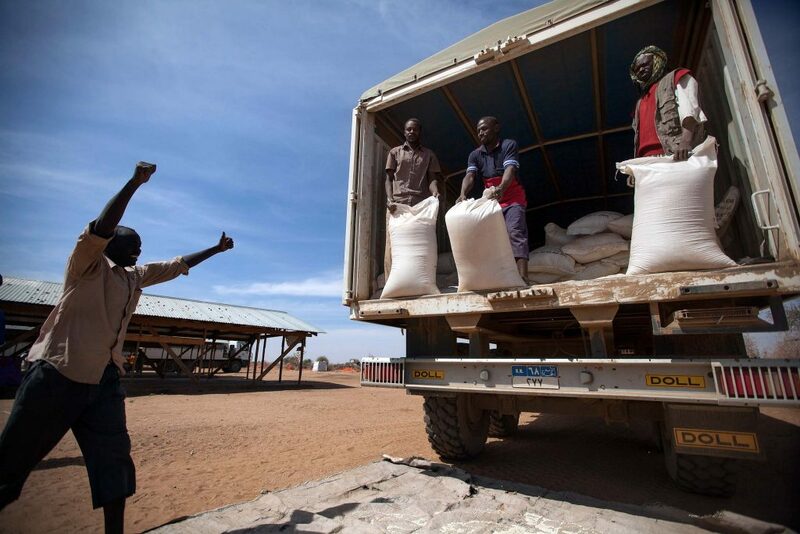 The World Food Programme (WPF) distributes food aid in North Darfur. Photo by Albert Gonzalez Farran, published online by UNAMID. Via Flickr Creative Commons. This is essentially using money bookmarked for international aid to support American farmers. Once produced, the food is then transported to final destinations by way of ships. The US requires 50% of it to be carried by American ships. This, once again, is an example of the government using aid money to subsidize and support American interests to the detriment of their cause. In this case, a substantial amount of money is wasted on shipping rates that are about 40% higher than competitive rates. The last problematic element of US food aid is “monetization,” wherein the food is sold in recipient countries by NGOs in order to fund their causes. The money saved is just one way in which sourcing from recipient countries would be beneficial to the cause of promoting food security. It is estimated that if food aid was sourced from the countries in need themselves or regional neighbours, and international vessels used to ship it, the US would save $300 million per year. The money saved could go towards helping feed another 9 million in need. A shift in policy could help local farmers in two ways. First, were foreign food not provided at much lower costs than possible for local farmers, they would not have to compete with foreign competition for their livelihood. While this would raise prices of food, this could be solved by giving aid money directly to local farmers, allowing for lower prices and expansion of current operations. Were local farmers to be supported, the economy would no doubt be strengthened in turn allowing for other development opportunities without need of monetization. Another way to improve food security across the world would be to direct aid towards distribution efforts. Often, famine is not the result of drought alone, but also because of political conflict. Conflict often creates obstacles in access to food for large numbers of people. Money earmarked for food aid could go towards subsidizing food costs for those who simply cannot afford to feed themselves and towards distribution efforts in areas suffering from conflict. 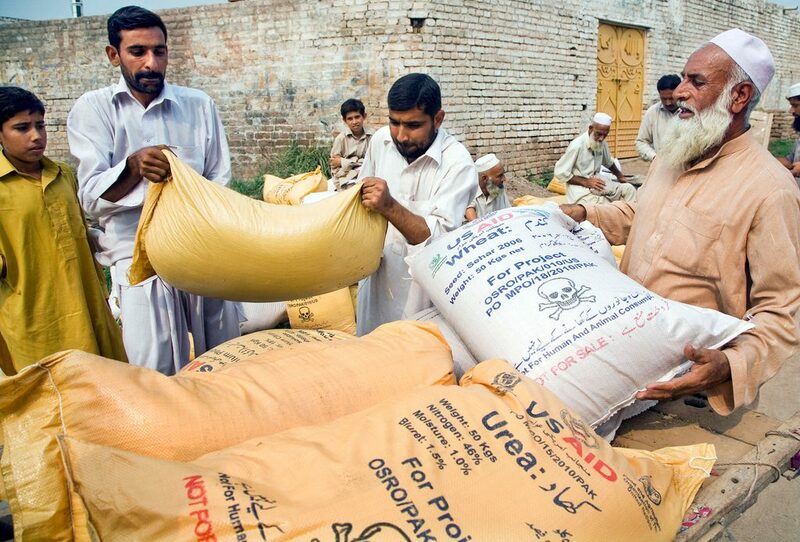 USAID wheat and vegetable seeds distributed amongst farmers in Pakistan. Photo by USAID, via Flickr Creative Commons. The issue of distribution then leads to new concerns over how to best distribute food. In Northern Kenya, for example, food aid to the nomadic Northern Turkana people has led to sedentarization. This major change in lifestyle is controversial as it not only is it an example of foreign intervention causing changes in cultures, butthe sedentarization has also begun to degrade the environment and cause a number of other issues. While it is certainly a good thing the Turkana are being fed, it is not necessarily true that food aid is needed to do so. Their neighbour to the south, the Southern Turkana, have found ways to adapt to the changing landscape while not giving up their nomadic lifestyle. They survive primarily through the sharing of both resources and responsibilities. This then begs the question: at what point should foreign states intervene? There needs to be a balance between saving lifes and providing too much to the point where societies begin to change. One reason why the Turkana, and many others across the world, are beginning to struggle is climate change. Any discussion of food security without mention of climate change would be incomplete. If the international community is dedicated to food aid and to helping put an end to famine and food insecurity, they will need to work on their impacts on climate change in addition to providing money and food. With important bodies of water shrinking, combined with reduced rainfall, many communities in third world countries can no longer rely on their original sources of food and water. With an overwhelming majority of greenhouse gases coming from developed and developing countries, the onus is on them to reduce emissions. Any policy truly dedicated to helping feed the hungry across the world must be aware of the impacts of climate change and of who is at fault. 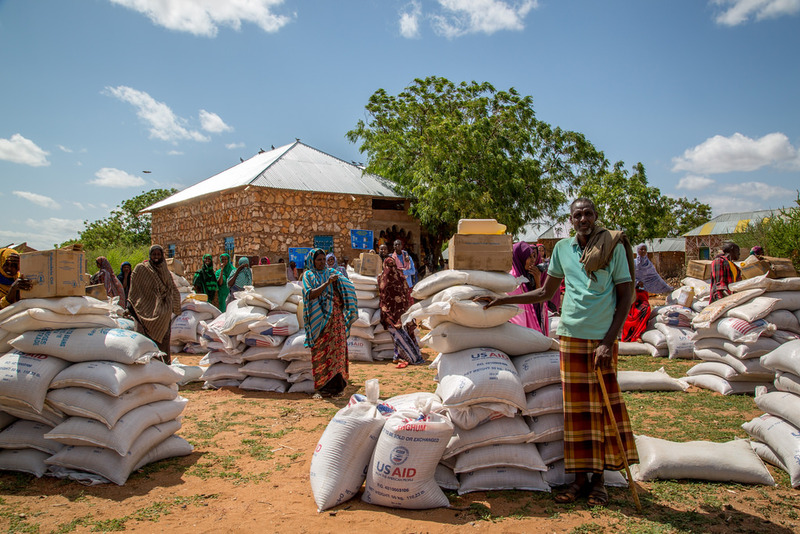 From changing the flow of money to maximize aid, to supporting local farmers to addressing climate change, there is much room for improvement in current food aid policy in the international community. Focus should be put on supporting and growing local agricultural sectors, finding ways to creatively tacking distribution in a way where everyone is fed, and making sure climate change does not progress any further. This will allow for countries to become more self sufficient, strengthen their economies, and reduce possibilities of corruption that come along with aid. Feature image by UNICEF Ethiopia via Flickr Creative Commons.